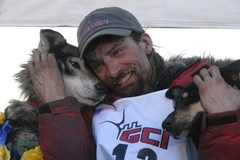 Today is the ceremonial start of the Iditarod, and I'm sad to miss it! There are 62 mushers this year. I'm rooting for Lance Mackey again. Tom B., Katie, Erik and I met him last year at the State Fair. He's just lovely! Very friendly and kind enough to pose for several pictures. Last year, a bunch of friends and I watched the mushers go by on the trail by Tom B. 's house. It was so much fun! Beer, spiked hot chocolate, warm muffins (thanks, Karli! ), and good friends. We called out their names as they passed and wished them luck. At work, we had an informal lottery and drew names of mushers. Payouts for first to scratch, red lantern (last to cross the finish line), winner and other categories. In the middle of the night, we had a huge bonfire and hot toddies. In the distance, we would see a faint headlight. As they drew closer, we would call out,"who are you?" They would respond, "number 21, Dallas Seavey!" Then we would clap and yell good luck to him. It was fun and a once in a lifetime experience! I'll be monitoring the race closely from here. GO LANCE!! !